Wiresoft is a No.1 manufacturer of secured enterprise server environments and artificial intelligence management solutions which simplify digital computer networks, and noticeably reduce system maintenance and software serials costs. The future starts with the managed delivery and deployment of software accross an Internet Channel. ANA is an Internet savvy software agent responsible for diagnosing and fixing problems as well as installing product enhancements and updates on Firegate Servers. The Sentry Security Platform is a stand-alone high-performance, low-maintenance firewall, anti-virus, anti-spam and VPN platform that provides comprehensive perimeter defense at the network layer against Internet security threats. The self-configuring firewall and advanced VPN services makes the Sentry a great fit for any business. Sentry blocks viruses, worms and Trojan programs from entering the company network in either transparent or proxy mode depending upon the business environment. With its one million email message a day capacity, the Sentry is also an expandable multipurpose security platform that does away with Client Access Licenses and includes monitored operation services at no additional cost (ANA). This program can be very useful for parents when they want to supervise their children on mobile phones to protect their online browsing for safety purposes. Download app from link above! At the heart of Sentry’s platform is a patented technology called ANA. 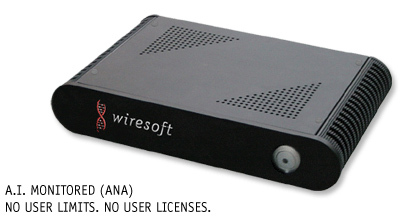 The Wiresoft Sentry Automated Network Administrator (ANA) monitors your network security remotely assuring your business continuity. ANA is the first of its’ kind to use a patented artificial intelligence technology that monitors, learns, alerts and takes action to remedy any issues. The Sentry’s unique proactive approach to network protection greatly reduces resource requirements eliminating the need for added managed service costs. ANA’s artificial intelligence engine automatically shares network security challenges from thousands of businesses globally virtually eliminating the need to have to experience network security issues yourself. ANA is all about business continuity, reducing costs and complete protection of your network at a very affordable price. The Sentry Unified Threat Management (UTM) solution does away with the high costs of protecting your network keeping the common business as secure as their Fortune 500 competitor. The Enterprise Sentry Security Platform is a complete perimeter UTM / ITM security solution in a compact 1U rack mountable turnkey network security appliance that provides VPN speeds of over 50mbits and Firewall speeds of over 200mbits. The Sentry Enterprise offers comprehensive all-in-one protection by stopping spam, viruses, worms, trojans, and hackers before they enter your network. Embedded Anti-Virus scans for over 50,000 malware signatures, providing both transparent data-stream and proxy scanning as information traverses the firewall. Advanced junk mail processing eliminates false positives and provides each network user with individually customizable antispam preferences. Configurable firewall provides granular control over all packets entering or leaving the network. Intuitive virtual private network features offer seamless road warrior and site-to site tunneling connectivity. Sentry Enterprise is a robust RAID-1 appliance that requires no per set licenses and offers full feature functionality out of-the-box for adaptability to all future security threats and network needs. The included ANA (Automated Network Administrator) system monitors and assures that each Sentry is online and functioning properly, and has the embedded latest system revision and antivirus signatures updates.